The Ultimate Folding Screen Dress Kit creates a professional, theatre-like appearance by draping your screen with an eye-catching velour Dress Kit. 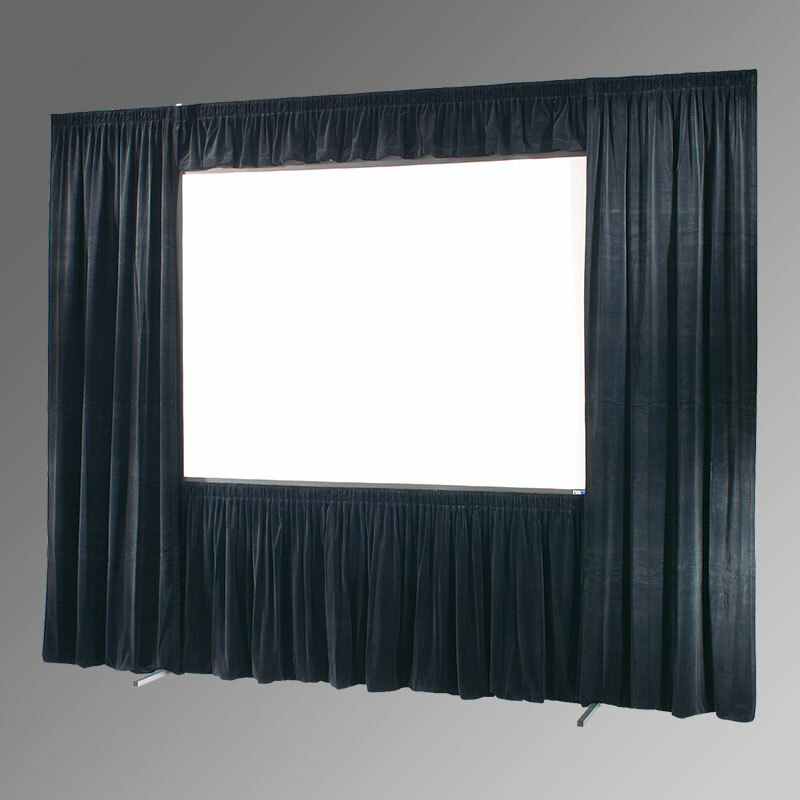 Drapery curtains surround the viewing surface, pulling the audience’s focus to your presentation on the screen. In addition to framing your presentation, the velour curtains will hide projection equipment, shield projector light from the audience, and help eliminate ambient light in the projection area. Also available with IFR (Inherently Flame Retardant) Velour. IFR Velour never needs retreating. It is flame retardant for the life of the fabric. IFR is more resistant to wrinkling than standard Velour, yet is 15% lighter weight for easier installation and transportation. Rich black 20 oz. velour surround the viewing surface, focus attention on the screen and frame your visual presentation. Also available in rich navy or a variety of custom colors. All Dress Kit fabrics are flame proofed to meet fire safety codes. Dress Kits are especially useful for rear screen presentations. The velour curtains conceal the projection equipment, shield the audience from projector light and help exclude light from the projection area. Complete Dress Kit includes 46" (117cm) skirt, 12" (30cm) valance, and two 32" (81cm) wide side drapes, with valance and drapery mounting bars. Hardware attaches without tools to the fittings found on all UFS frames. Screen size and aspect ratio may be adjusted by raising the optional adjustable skirt bar in 6" (152mm) increments to conceal the lower portion of the viewing surface. Warranted for one year against defects in materials and workmanship.